Background: Direct to consumer advertising is increasingly used by the pharmaceutical industry, but its benefits and harms have yet to be summarised in a comprehensive and rigorous manner. Methods: A systematic review was conducted of robust evaluations of the impact (positive and negative) of direct to consumer advertising. A broad range of databases and data sources (including Cinahl, Embase, HMIC, HSRProj, Medline, PsycInfo, and the internet) were searched from inception to 2004. Results: From 2853 citations only four reports were found that met the strict inclusion criteria and provided usable results. Direct to consumer advertising is associated with increased prescription of advertised products and there is substantial impact on patients’ request for specific drugs and physicians’ confidence in prescribing. No additional benefits in terms of health outcomes were demonstrated. Discussion: Direct to consumer advertising is banned in most countries, and the research evidence tends to support the negative impact that is feared by those who support a legislative ban. Further research is needed into the clinical and economic impact of direct to consumer advertising in healthcare systems. Proponents of DTCA argue that advertisements are a legitimate form of patient information, and the benefits of advertisements targeted directly at patients and the public include increased health awareness; improved patient-doctor communication; improved concordance and, ultimately, improved health outcomes.5 Opponents of DTCA highlight the fact that advertisements are not unbiased sources of information but, instead, tend to be one sided product appraisals which produce unrealistic expectations of the benefits of medicines. The consequences of these advertisements are that increased and inappropriate demand for new and expensive drugs will be generated. Such enterprises might also distort and undermine local and national initiatives to increase the appropriate and efficient prescribing of drugs. Further, generating public demand for specific treatments and drugs is likely to change fundamentally the nature of the patient-doctor relationship; doctors may feel under pressure to prescribe inappropriate and costly drugs even when they feel this is not appropriate to both the patient and the healthcare system as a whole.2 DTCA therefore has the potential to influence the quality of patient care at every level—from the individual patient encounter to the implementation of national policies and the overall efficiency of healthcare systems. Each of these can be answered empirically using appropriate research methods. DTCA is currently allowed only in the US and New Zealand, although there are moves to introduce a ban in New Zealand.6 The European Parliament has emphatically opposed DTCA in line with the “precautionary principle”, protecting or denying European consumers depending on one’s perspective. Despite this decision, DTCA is a topic that will not go away, especially as the internet has made national restrictions seem increasingly irrelevant. There is a clear division between those who would support DTCA and those who oppose it. Ongoing debates relating to the role of DTCA, and whether legislation should remain or be changed, have hitherto been made on the basis of selective reporting of research evidence. To our knowledge, there has not been an attempt to produce a systematic overview of the research evidence into this topic. 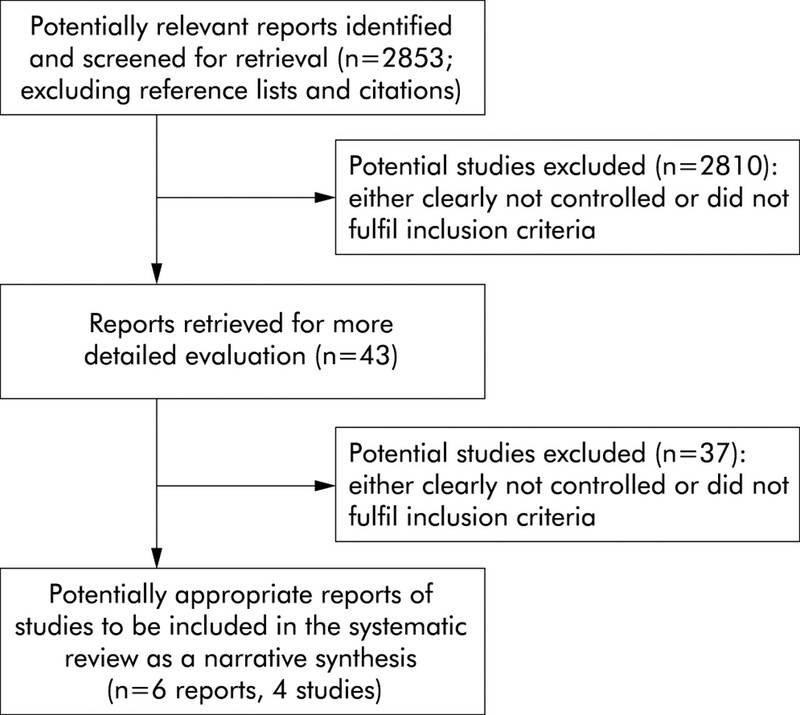 Systematic reviews have the potential to inform both patient care and health policy. In order to inform the debate on DTCA, we have conducted a systematic review of the clinical and economic impact of DTCA on patients and clinicians—both positive and negative. We searched a wide range of biomedical, psychological, “grey” literature, and marketing databases (ABI Global, Cinahl, Embase, HMIC, HSRProj, Medline, PsycInfo, Sigle, Web of Science, Medline Plus and PreMedline, DARE, and NHS Economic Evaluation Database) from 1987 to October 2004. Free text search terms were created around the term “direct to consumer advertising” and associated synonyms. Medical subject headings (MeSHs) relating to consumer attitudes, patient education, consumer health information, drug information, advertising, and marketing were also exploded. The reference lists of included studies were scrutinised for further studies and keyword searches of the internet were also undertaken. direct and indirect costs (including drug costs, healthcare and social costs). Studies that only reported knowledge and awareness of advertising campaigns were excluded. The results of our literature searches were scrutinised independently by two researchers. References to studies which could potentially be included were ordered and scrutinised further. A flow diagram describing the inclusion and rejection of studies is shown in fig 1. We anticipated that substantial heterogeneity in terms of study design, populations, and mode of DTCA might be found among the studies, making a formal statistical method of synthesis (meta-analysis) inappropriate. We therefore conducted a descriptive synthesis in line with accepted guidelines.7 Salient design features and outcomes were considered, with due reference to the overall quality of the evaluation. For example, prospective controlled studies were considered superior to cross sectional studies, and interrupted time series were considered to be interpretable when several time points before and after the intervention or introduction of DTCA were presented. Of the four included studies, three were interrupted time series, comparing periods of time before and after the introduction of DTCA.16–18 Two interrupted time series studies conducted in the US found a significantly increased trend in the prescribing volume of drugs that had been the subject of DTCA campaigns.16,17 The effect of DTCA seemed to both increase the number of new diagnoses of a condition and tended to increase the proportion of prescriptions specifically for the advertised drug. For example, Zachry et al17 found that advertising budgets for cholesterol lowering drugs increased year on year during the 1990s, and that every $1000 spent advertising cholesterol lowering drugs was associated with approximately 32 extra people being diagnosed with hyperlipidaemia and 41 advertised cholesterol lowering drugs being prescribed. Similarly, Basara16 found that a specific campaign for a migraine treatment (sumatriptan) was associated with a marked increase in sales over the first month of a campaign (p<0.0006) which, if extrapolated across the US market, was associated with $11.5 million in sales annually. A European study18 examined the impact of a mass media campaign sponsored by a pharmaceutical company to increase awareness of and treatment for a fungal nail condition (onchomycosis). A ban on product specific DTCA prevented the company naming their product, but the overall “awareness campaign” was associated with both an increase in new prescriptions and the market share of the company’s specific antifungal agent (increased prescribing volume during the period of the campaign from 6.50 prescriptions per 1000 person years (95% CI 6.33 to 6.66) to 15.2 (95% CI 13.5 to 16.9)). A controlled study by Mintzes and colleagues19–21 examined the impact of DTCA in the US compared with Canada (where DTCA is banned, although cross border exposure to DTCA still exists) using a cross sectional survey of physicians and patients. Patients in the US were more likely to request DTCA drugs (7.3% v 3.9%, OR 2.2, 95% CI 1.2 to 4.1), and physicians in both settings were more likely to acquiesce to these requests despite feeling ambivalent about the drug that was prescribed. Those who requested a specific DTCA drug were 16 times more likely to receive a drug than those who did not request a specific drug (OR 16.9, 95% CI 7.5 to 38.2). No studies were found that examined the impact of DTCA on patient satisfaction with care, or the impact of DTCA and altered prescribing on actual health outcomes. There were also no studies that examined the cost effectiveness of DTCA by combining health outcomes and the economic costs of altered prescribing. The research presented in this review tends to support this assertion. No empirical research has demonstrated better communication and improved health outcomes. Given the lack of evidence of a beneficial effect on healthcare quality, concerns that DTCA undermines efforts to improve efficiency and cost-conscious prescribing—including use of generic drugs where branded drugs confer marginal benefit—appear well founded. The results of the study conducted in the Netherlands also raises questions about the effects of industry funded disease awareness campaigns.18 The limited evidence available seems to suggest that such campaigns can increase market share and product awareness. Similarly, it does seem to create markets which did not previously exist by generating demand for treatments for non life-threatening conditions about which the public has little awareness—such as fungal nail infections, social anxiety disorder,26 or female sexual dysfunction.27 From the perspective of the pharmaceutical industry, disease awareness campaigns may offer an alternative promotional approach in regions where DTCA is currently prohibited. However, from the perspective of healthcare systems and governments struggling to contain ever increasing drug budgets, campaigns to increase awareness of non-life threatening conditions could generate demand for treatments which will ultimately divert time and resources away from other more important conditions.26,28 This is a topic where further research is clearly justified. Direct to consumer advertising (DTCA) is currently allowed only in the US and New Zealand. Proponents suggest DTCA is a legitimate form of patient education with the potential for more informed patients and better health care. Opponents question the wisdom of DTCA, since it potentially distorts the patient-doctor relationship, rational health policies and prescribing practice, and generates demand without necessarily improving health outcomes. A systematic review of evidence of the clinical and economic consequences confirms that DTCA does influence patient demand and doctor prescribing behaviour. No evidence of health benefit was found since this had not been examined in any detail. Calls to allow DTCA should be resisted in the absence of any evidence of benefit from such an influence of prescribing behaviour. These are also the conclusions that can be drawn from the first systematic empirical overview of this topic. General Accounting Office. Prescription drugs. FDA oversight of direct-to-consumer advertising has limitations. Report to Congressional Requesters GAO-03-177. Washington, DC: United States General Accounting Office, 2002. Mintzes B. For and against. Direct to consumer advertising is medicalising normal human experience: for, BMJ2002;324:908–9. Josefson D. Drug advertisers face scrutiny after potentially breaking FDA rules. BMJ2002;325:1262. National Institute of Health Care Management. Prescription drugs and mass media advertising 2000. Washington, DC: NIHCM Foundation, 2001. Bonaccorso SN, Sturchio JL. For and against. Direct to consumer advertising is medicalising normal human experience: against, BMJ2002;324:910–1. Burton B. Drug industry to fight New Zealand’s move to ban direct to consumer advertising. BMJ2004;328:1036. NHS Centre for Reviews and Dissemination. Undertaking systematic reviews of research on effectiveness. CRD Report 4 (2nd edition). York: University of York, 2001. Moher D, Cook DJ, Eastwood S, et al. Improving the quality of reports of meta-analyses of randomised controlled trials: the QUOROM statement. Lancet 1999;354:1896–8. Cook TD, Campell DT. Quasi-experimentation: design and analysis issues for field settings. Boston: Houghton Mifflin, 1979. Bero L, Grilli R, Grimshaw J, et al. The Cochrane Effective Practice and Organisation of Care Group (EPOC) module. The Cochrane Library. Issue 4. Oxford: Update Software, 1998. NHS Centre for Reviews and Dissemination. Making cost effectiveness information available: the NHS Economic Evaluation Database project. CRD Report 6. York: University of York, 1996. Anon. National survey of consumer reactions to direct to consumer advertising. Prevention Magazine1999. Weissman JS, Blumenthal D, Silk AJ, et al. Physicians report on patient encounters involving direct-to-consumer advertising. Health Aff (Millwood) January–June 2004 (Supplement web exclusives :W4–21933. Rosenthal MB, Berndt ER, Frank RG, et al. Promotion of prescription drugs to consumers. N Engl J Med 2002;346:498–505. Wosinska M. Just what the patient ordered? Direct to consumer advertising and the demand for pharmaceutical products. Harvard Business School Marketing Research Papers Nos 02–04 2002. Basara LR. The impact of a direct-to-consumer prescription medication advertising campaign on new prescription volume. Drug Inf J1996;30:715–29. Zachry W Mr, Shepherd MD, Hinich MJ. et al Relationship between direct-to-consumer advertising and physician diagnosing and prescribing. Am J Health Syst Pharm 2002;59:42–9. ’t Jong GW, Stricker BHC, Sturkenboom MCJM. Marketing in the lay media and prescriptions of terbinafine in primary care: Dutch cohort study. BMJ2004;328:931. Mintzes B, Barer ML, Bassett K, et al.An assessment of the health system impacts of direct-to-consumer advertising of prescription medicines (DTCA). Volume III: Patient information on medicines comparative patient/doctor survey in Vancouver and Sacramento. Vancouver: University of British Columbia Health Policy Research Unit, 2001. Mintzes B, Barer ML, Kravitz RL, et al. Influence of direct to consumer pharmaceutical advertising and patients’ requests on prescribing decisions: two site cross sectional survey. BMJ 2002;324:278–9. Mintzes B, Barer ML, Kravitz RL, et al. How does direct-to-consumer advertising (DTCA) affect prescribing? A survey in primary care environments with and without legal DTCA. Can Med Assoc J 2003;169:405–12. Aitken M, Holt F. A prescription for direct drug marketing. McKinsey Quarterly2000:82. Wolfe SM. Direct-to-consumer advertising—education or emotion promotion? N Engl J Med2002;346:524–6. Mulrow CD, Cook D, eds. Systematic reviews: synthesis of best evidence for healthcare decisions. Philadelphia: American College of Physicians, 1998. Hoffman JR, Wilkes M. Direct to consumer advertising of prescription drugs. BMJ1999;318:1301–2. Moynihan R, Heath I, Henry D, et al. Selling sickness: the pharmaceutical industry and disease mongering. BMJ 2002;324:886–91. Moynihan R. The marketing of a disease: female sexual dysfunction. BMJ2005;330:192–4. Quick JD, Hogerzheil HV, Rago L, et al. Ensuring ethical drug promotion—whose responsibility? Lancet 2003;362:427.